Amy has over 5 years experience as a dental assistant, and has worked with Dr Philip Chou for 2 of those years. She enjoys working in a fast paced environment and has a caring, friendly nature. Amy is especially good at ensuring patients are comfortable and understand their dental treatment. She has a welcoming and gentle hand with children which comes from having a 5 year old daughter of her own. When Amy’s not at work, she enjoys socialising with friends, listening to music, spending time with family and going to the gym. Jenna is our highly valued practice manager who covers many roles within our practice. 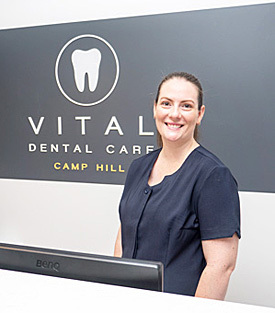 She brings considerable experience to the team, having been in the dental industry for 15 years. Jenna was a recipient of the Australian Dental Association’s award of excellence and as a result her paper on infection control in the modern dental practice was published in the Australian Dental Association Magazine. She supports what we do everyday, and ensures our practice runs smoothly and efficiently. Jenna’s care of our patients is of the highest possible standard, and she always goes the extra mile to ensure our patients are satisfied and happy. In particular, as an adoring mother of two, Jenna has a special interest in helping other parents with the preventive care of their children. Jenna loves to escape on her weekends to go camping and 4×4 driving with her husband and kids. 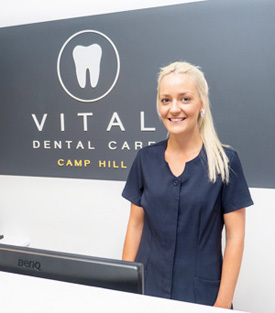 If you’re looking for a Camp Hill family dentist that’s open early or on Saturdays, contact Vital Dental Care today. On the day emergency services are available!